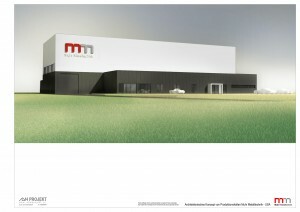 MM Technics, a newly formed American subsidiary of Muhr Metalltechnik, Gmbh + Co. KG, is constructing a metal stamping facility in Newberry County. The company is expected to invest at least $12.6 million and create 65 jobs over the next five years. Headquartered in the state of North Rhine-Westphalia, Germany, Muhr Metalltechnik employs more than 200 associates at its flagship facility in Wenden and a second facility constructed in Poland in 2012. The company uses state-of-the-art mechanical feed presses, deep drawing hydraulic presses and fully-automated cutting and welding equipment to supply more than 15 automotive companies throughout Europe. MM Technics will begin construction of a new 40,000-square foot Newberry County facility in January and expects the new operation to be online by November of 2017. The facility will begin with a new 800-ton mechanical feed press, which it will use to stamp metal structural parts as a Tier 1 BMW supplier. Those interested in joining the MM Technics team should contact Newberry County Economic Development by email at info@newberrycountysc.org. MM Technics is constructing a new manufacturing plant in Newberry County. $12.6 million investment to create 65 jobs over the next five years. This facility will be Muhr Metalltechnik’s first North American manufacturing facility, and the Newberry County plant will supply stamped metal parts to BMW’s Upstate assembly plant. The company expects construction to begin in January, and the plant is expected to come online by the end of 2017. Based in Wenden in the state of North Rhine-Westphalia, Germany, Muhr Metalltechnik GmbH & Co. KG is a growing automotive supplier with more than 30 customers throughout Europe. Started as a radiator manufacturer more than 50 years ago, the company offers its customers fully integrated and optimized solutions from component design to large batch production. Over the years it has developed a reputation for flexibility and reliability, and houses a wealth of experience in its core expertise of metalworking and welding.